Rick Nielsen's extensive site on the "Mississippi Saxophone"
Mike Will's page is an excellent source for info on the diatonic harp. Pat Missin not only plays, he is a scholar on harmonica history. Extensive links, lessons, store and more. Overblow fanatic Tinus Koorn plays everything on a single diatonic harp. 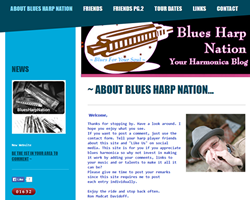 This site is for chromatic harmonica players; extensive resources. Everything for amplifying harps; amps, custom wood mics, etc. Harmonica Master Class specializes in educational materials for blues freaks. England checks in with "The Harp Players Harp Site"--deep stuff. Planet Harmonica has a global perspective and a wide array of resources.